After my minor triumph of finally making some successful Indian food with the dhal makhani recipe, I decided I was on a roll and should cook some more. 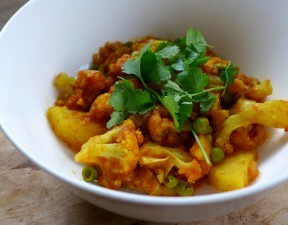 Potatoes and cauliflower are two of my favourite vegetables at the moment, so I decided to give them a whirl in the Indian classic that combines the two, aloo ghobi. This is based on a recipe from a small book on “curries” that I picked up in an op-shop a zillion years ago for 25 cents. I only kept the book because it had a great weight to volume measurement converter for all kinds of ingredients. This is a dryish vegetable dish. It has very little sauce and what sauce there is reminds me of making kasoundi, though on a smaller scale. The partly steamed vegetables are then finished in the sauce, which cooks away to almost nothing, just flavouring and coating the vegetables. Add the tomato, mix and cook until the sauce reduces to a thickish paste. Steam the potato for 5 minutes and then add the cauliflower and steam for another 3 minutes. Both should be almost done. Add the ground coriander, garam masala, chilli and cumin to the tomato sauce. Add the potatoes, cauliflower and peas and mix gently to coat all the veg completely. Cover and cook until the vegetables are just tender.